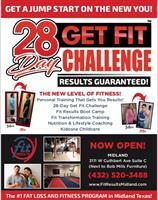 The 28 Day Get Fit Challenge is NOT A BASIC "BOOTCAMP"; it is a 28-Day Group Personal Training Fitness program designed for GUARANTEED RESULTS using Resistance Training, Cardiovascular Training and High-Intensity Interval Training (HIIT) that has many benefits, including burning more fat and calories. The Program includes nutritional & lifestyle coaching - NOT DIETING. I have taken the best of Personal Training, HIIT and "Bootcamp" programming and designed a program for ACCELERATED FAT LOSS. Fit Results is the new level of fitness. Our new fitness facility’s programs are backed by more than 30 years of experience in personal training, weight loss, fitness boot camps, improved health & fitness, nutritional & lifestyle coaching, and results. Our staff here at Fit Results is here to help you determine and achieve your desired goals, whether you want to lose weight, get in shape, or simply improve your overall health.